I had every intention of blogging each and every day from Banff…the spotty internet connection we had there dictated otherwise. I’ve been back for a couple of days now. It’s wonderful to be home, but I miss the wonderful views, the walk into town, and room service. I also miss being able to type and think without the constant interruption of “Mom, I want….” But all in all, it’s good to be home. As we walked into town from the Banff Springs Hotel, there was a bookstore. My husband always steered me to the other side of the road, knowing that if I went in there, we would go no further. I tried distracting him by pointing off into the distance and shouting “Oh, look, there’s a Grizzly Bear” “Moose!” and even, “Yeti” one day. He didn’t fall for it. 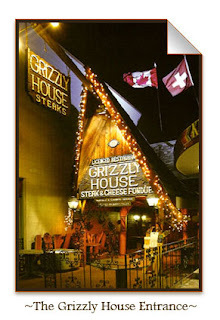 As a result, we were able to buy lots of souveniers for our family and friends and ate at The Grizzly House. I had a Buffalo Burger (bison actually) and my husband had steak fondue. Now, I pictured your typical fondue dish (cheese with meat that you dip bread into). Instead, a very hot rock was delivered to our table with a pile of raw steak. These cubes were plopped onto the hot rock and cooked to the desired doneness (1 min rare, 2 min med rare, 3 min med, 4-5 min, med well). My husband likes his meat “dead”, so we cooked it the maximum time. The steak was then dipped into various sauces or hot chili ketchup. YUMMY! If you are ever in Banff, you have to try it. Plus, there are phones at the table and in the bathrooms! On the menu was a map of the restaurant tables and the phone number associated with the location. What fun. The last day was bittersweet. We checked out early and then had two hours to wait for our shuttle. We walked into town one last time and went to the Whyte Museum of the Rockies. Then, as we walked back, my husband pointed me in the direction of the bookstore! Ecstasy! I was tempted by all the bestsellers in the front, but instead, I made my way to the local shelf. I browsed books about Canada, Banff, and then a shelf of novels written by Canadian authors. There, I found a treasure. 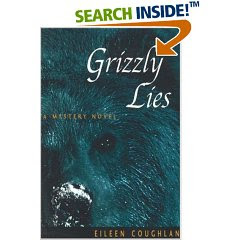 Grizzly Lies by Eileen Coughlin of Calgary! 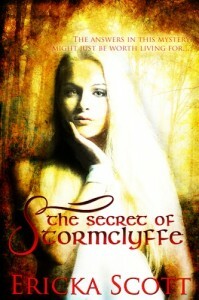 The book is set in Banff and I read it on the airplane home. I couldn’t put it down. The author captured the flavor of Banff and mixed it up with suspenseful tale of murder, poaching, with a sprinkling of romance. This entry was posted on Monday, April 14th, 2008 at 8:32 am in A Writer's Life, What I'm Reading. You can feed this entry. Responses are currently closed, but you can trackback from your own site.